The ubiquitous cell phone is now making its way into the world of credit risk analysis. In some countries, cell phone activity is now being used to assess how well a borrower might repay a loan. The idea is interesting, as it expands the list of potential data points community bankers may soon be collecting, in a never ending quest to get beyond simple existing credit scoring. Consider a recent study by economists at Brown University and the Entrepreneurial Finance Lab (EFL). They wanted to know whether a person's phone habits could correlate with creditworthiness. They analyzed more than 3,100 loans from a Caribbean bank in 2012 and compared it to the applicants' anonymized phone data. The paper concluded that certain types of mobile phone use (such as frequency), were accurate in predicting default patterns for some borrowers. This included borrowers without much, if any, formal financial history. The study found that those making more phone calls in the weeks leading up to applying for a loan were less likely to default. This could be a result of the potential borrower perhaps scouting business opportunities. Further, the data found that the more calls one makes likely means the person has a larger social network and quite possibly has access to more resources to repay a loan. In the end, the study concluded that the predictive nature of this approach gets close to traditional credit scoring means. Perhaps that is why this sort of data measurement is fast becoming a big business. Consider that Fair Isaac Corp recently signed a deal with Lenddo (a company specializing in smartphone data analysis for creditworthiness) and EFL to help process loans in Russia and India. Further, Bloomberg reports startup Juvo has teamed up recently with Liberty Global's Cable & Wireless Communications to analyze mobile phone data for credit risk in 15 Caribbean markets. Meanwhile, Equifax is doing the same type of data analysis in Latin America. There are literally dozens of fledgling startups now competing in this space. A deeper analysis of cell phone data analysis also finds other interesting things. These include analysis that finds the data includes more than just the number of calls and text messages. It also incorporates when calls and texts were sent and received, as well as how that data is relative to when a loan was requested. Cell phones aren't the only new frontier here however. Companies are also analyzing web browsing and social media activity to see if credit determinations surface. The regulations are still evolving around these new areas of customer data collection and how banks leverage it to make potential decisions, but it certainly is interesting. Keep your eyes open in the future for these sorts of things to begin to make their way into the world of US banking activities. In the meantime, while these emerging forms of risk analysis aren't likely to become a facet of the traditional form of risk measurement for US banks - only time will tell what the future brings here. The smart phone has changed many things in banking after all, so look for banks to continue to seek ways to leverage it to drive more business, capture more customers and help gain an edge in this hyper-competitive world. As JPMorgan himself said long ago - the more ways banks can assess their loan customer's creditworthiness, the better. Yields dropped 6bp due to lower than expected new home sales and investor concerns over global political uncertainty. Bank of America reported it is celebrating its 10Y milestone of mobile banking and that the channel has become the most used of all customer channels. The bank said it has 22mm active mobile users. Bankers should note that JC Penney has announced it will close 130 to 140 stores (about 14% of its total footprint), given weak sales and sluggish projected future growth. In an effort to capture billions in deposits over the next few years, Japanese mega bank Mitsubishi UFJ Financial Group said it will launch a new online lender called PurePoint Financial in the US. PurePoint will mostly be an online bank, but it will reportedly also have a few branches in key markets. Research by Cisco finds 33% of organizations that had a cyber breach reported a revenue loss of over 20%. Research by Vidyo finds the percentage of financial institutions that already deployed video banking last year was 10%, while those expecting to do so this year reached 50%. 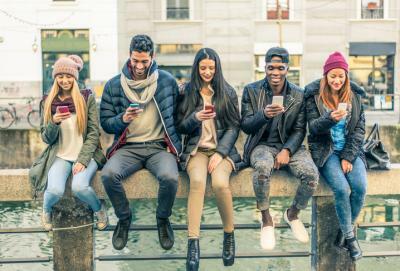 Deloitte research finds the following channels are the most influential to the buying decisions of millennials for advertisements: social media ads (54%), magazine ads (48%), search engine ads (48%), celebrity endorsements (43%) and radio ads (43%). Facebook research finds small businesses use online tools to advertise to potential new customers (75%), show products or services (74%), provide information such as hours, contact information, etc. (64%), communicate with customers or suppliers (63%) and sell products or services (59%). Royal Bank of Scotland Group said it plans to cut costs by $2.5B over the next 4Ys, after posting its 9th straight annual loss in 2016. The bank is 73% owned by British taxpayers, who bailed it out during the credit crisis.